1958 held at Richmond, Virginia. Pitcher Maxine Palmer of Pearl Laundry won all four games to lead the home town team to the National Championship. She shutout the first 3 opponents and then won final game 4-3. Pearl Laundry outscored their opponents 28-4 in the tournament. The outscored their opponents 24-0 in their first 3 games. 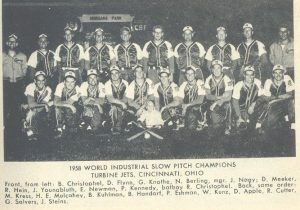 1958 held at Cleveland, Ohio. 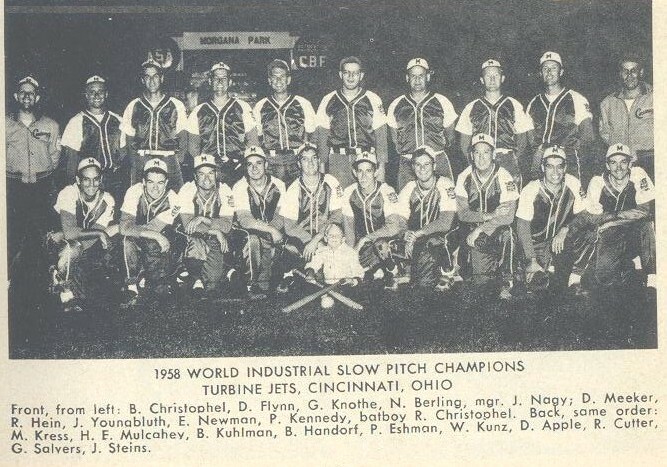 In 1958 the Open and Industrial were combined into one tournament. East Side defeated Sheffield 8-5 in the winners bracket final on the strength of Frank Panski’s 2 triples, a home run and 4 RBIs. accounting for half the teams runs. East Side had just defeated Helf Builders 17-7 on the strength of home runs by Panski, Joe Gauci and George Banchui. Sheffield advanced to the championship game by defeating Boone’s Bar of Kentucky 10-1 as Ron Annotico hit a pair of 3-Run HRs for Sheffield. In the Championship game, East Side Sporting Goods beat Sheffield 7-4. 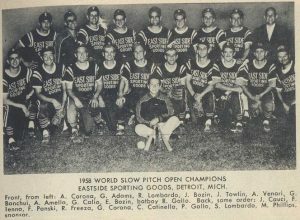 George Corona of East Side pitched the victory, hit 2 HRs and added 4 RBIs to lead the Detroit squad to the title George Branchui chipped in with a solo HR for good measure. Corona led the East Side bats in both homers and batting average. 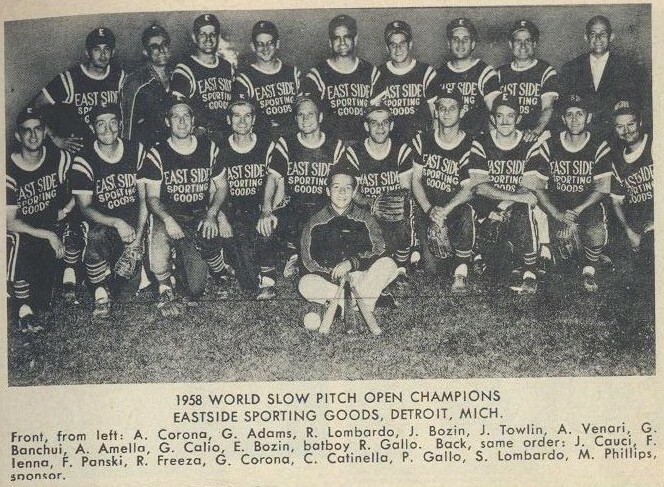 East Side’s Joe Gauci, who played the season with Sox’s Inn and was a pickup for East Side for the National Tournament helped the defense turn multiple double plays from his short fielder position. East Side went 6-0 in the tournament. The Detroit squad won their first game rather easily over Staten Island Stape Darts 7-1. They then came from behind and defeated Dapper Dan’s of PA 6-5 on a walk off Home Run by pinch-hitter Carl Cantinella. The next game saw the same situation as Detroit defeated defending champ, Gatliff Auto of KY. Gatliffs had 17 hits in the game, but only 6 runs, due to the defense of the Detroiters who turned six double plays in the game. With the game tied at six, going into the bottom of the 10th inning, two outs and third basemen Phil Gallo came to bat. He got a hold of one of Vern Robert’s pitches and when it landed on the other side of the left field fence, the East Side team had done it again.